Jeff Begay (at right) is the Del E. Webb School of Construction Outstanding Alumni of the Year award winner. 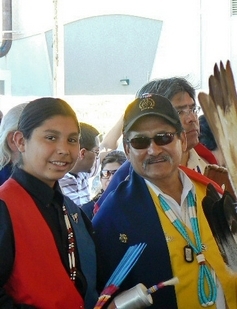 He’s is pictured attending a Salt River Pima Maricopa Indian Community Veteran’s Pow Wow. At left is Stephen Tahmahkera, son of Gary Tahmahkera, a microbiology laboratory coordinator in ASU’s School of Life Sciences. The construction school is part of the School of Sustainable Engineering and the Built Environment, one of the Ira A. Fulton Schools of Engineering at Arizona State University. Begay graduated with a degree in construction management in 1974 and now is manager of business development for Kitchell Contractors Native American Division. Through his division’s work, Begay has helped lead efforts to bring quality construction services to Indian lands. Lack of quality building has long plagued Indian reservations, he says. Many reservations “are like Third World countries. They are struggling to develop a strong economy, struggling to build good infrastructure,” Begay says. Begay’s work goes beyond providing construction services. 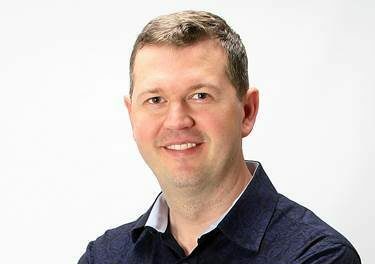 “There’s a perception that a construction management graduate with an engineering background works only with concrete, steel and wood, and isn’t really involved with much of anything else,” he says. Among his efforts beyond construction business, Begay has been instrumental in organizing Kitchell’s Cultural Sensitivity Seminars, inviting guest speakers from a various tribal communities to make presentations about their history, culture and community. Begay also has worked as a general contractor and been a consultant to the Gila River Indian community, assisting in the development of governmental facilities, infrastructure and community housing programs. He is also a gourd dancer, as part of a Native American Warrior Society ceremony that honors and helps their warriors – men and women currently serving in U.S. military, as well as all military veterans. Earlier this year, Begay helped lead an effort to rebuild and refurnish the home of a Navajo tribal member and fellow Vietnam veteran whose home had been nearly destroyed by vandals. Begay was born and raised in Teesto, Ariz., on the Navajo Indian Reservation. He served in the U.S. Army, including a tour of duty in Vietnam in 1967 and 1968. 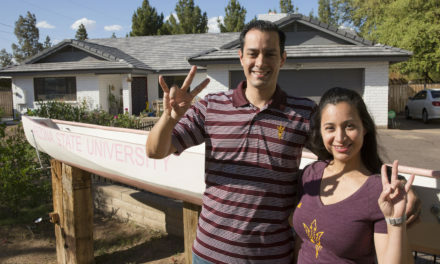 He later went to ASU on the GI Bill and earned a scholarship from Kitchell Corp. which helped him earn his degree at ASU. He is a former president of American Indian Council of Architects and Engineers and former president of the American Indian Veteran’s Memorial Organization. He’s also a founding member of the executive committee of Del E. Webb School’s Construction in Indian Country organization and the founder of the school’s Native American Construction Management Endowment. 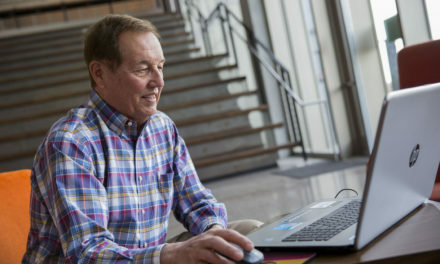 The impact he’s had on Native American communities prompted his nomination for the alumni award by colleagues in the industry and the Native American community.